Ummmm... can somebody tell me what rite this is? Any ideas for photo captions? I'm just a little too befuddled to even spend brainpower on it. Thanks to Uncle G for the montage, via Freeper. no mantillas, but most of the women do have their heads covered . . .
Looks like they've already got the chrism out. But thank God the photographer left before the part of the ceremony requiring the use of the paschal candle! 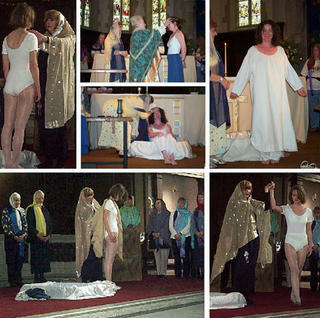 If Tertullian were alive, he might just be persuaded to support women's ordination by looking at these marvy pics. Wasn't he the one who said, "Credo quia absurdum est," "I believe it because it is absurd"? Really, I begin to develop a soft spot in my heart for these ditzy chics. They're so silly that they're kinda sweet, poor things. THEY'RE not going to take over the world.